The Peacock diamond gets it's name from the present owners of the diamond, C.D. Peacock, Chicago's Premier jewelry store, founded in 1837. According to the Gemological Institute of America, the diamond is a 20.65-carat, fancy intense yellow, internally flawless (IF), radiant-cut stone with dimensions of 15.62 X 14.49 X 9.37 mm. Fancy intense grade among yellow diamonds is not so common. The rarity of this color combined with the size, make this stone a unique and notable diamond. In the photograph the diamond is displayed on a special mount made up of Platinum and 18k Gold flanked on either side by modified triangular-cut D-color diamonds. The radiant-cut is a combination of the emerald-cut and brilliant-cut, that was developed in the 1970s. Like the emerald-cut, the radiant-cut has trimmed corners, making the diamond eight-sided. The emerald-cut is used on the top of the diamond, and the brilliant-cut facets on the bottom of the diamond. The radiant-cut diamond therefore, incorporates the properties of both cuts, the emerald-cut and the brilliant-cut. The radiant-cut has the brilliance of the brilliant round diamonds, and the ability to show off the color, characteristic of emerald-cut diamonds. Being a yellow diamond, the Peacock diamond is obviously a type I diamond, whose distinguishing feature is the presence of trace quantities of Nitrogen as impurities, in the crystal. Under type I diamonds there are two sub-groups that can show off the yellow color - type IaAB and type Ib. In both groups the ability to show off the yellow color is associated with the distribution of Nitrogen as groups of odd numbers. In IaAB besides groups of 2 and 4 atoms which do not affect the color of diamonds, Nitrogen also exists as groups of 3 atoms known as N3 centers, which absorb visible light in the blue end of the spectrum, imparting a pale to medium yellow color to the diamonds. 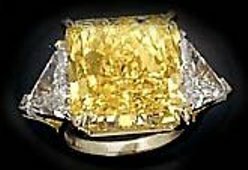 In type Ib diamonds Nitrogen occurs as single atoms (1 is an odd number), and these atoms also absorb light in the blue end of the spectrum imparting an intense yellow color like the canary yellow color. The Peacock diamond may belong to either one of these two groups- type IaAB or type Ib. The House of Peacock, was first established in 1837, the same year Chicago was incorporated as a city. This was the first retail jewelry establishment in Chicago, and according to some historians marked Chicago's passing "from the semi-savage conditions to civilization and refinement." The founder of the company was Elijah Peacock, a skilled third generation watch and jewelry repairman. In 1889, Elijah appointed his son Charles Daniel as successor to the company and the name of the company was changed to C. D. Peacock. As the city of Chicago grew, the company also expanded along with it. Each store was designed to be a show place for the finest jewelry, watches and gifts. As the oldest guild jeweler in the Chicago area, C. D. Peacock is committed to excellence, quality and service. The Peacock diamond was put on a special mount made up of platinum and 18K gold, flanked on either side by two triangular-cut colorless (white) diamonds and displayed at C. D. Peacock, Northbrook Court, Chicago, along with other rare fancy colored diamonds, fine and antique jewelry and unique accessories. The whole idea of purchasing this unique fancy intense yellow diamond , and displaying it with two triangular-cut colorless diamonds on either side, was to educate the public about the existence of diamonds in fancy colors other than the usual white or colorless diamonds. The common public perception is that diamonds exist only in one color- i.e. colorless or white. The exhibition of the Peacock diamond and other rare fancy colored diamonds was to change this public perception, and to enlighten the public that diamonds do exist in other colors, beside the colorless or white variety. Mr. Ray Perlman, former chairman of the New York Diamond Dealers Club, and a consultant to C. D. Peacock says that most people have no idea that diamonds occur in a color other than white ( colorless). Yet when you ask them to name some of the world's most famous diamonds, almost invariably they would mention the Hope Diamond, which is a fancy intense blue diamond, and the Tiffany Diamond, which is a golden yellow diamond. Contrary to public perception, the commonest colors in diamonds are yellow and brown. A majority of diamonds that are mined are in the range of pale yellow to brown color. This is known as the normal color range. This is obvious because 98 % of all naturally occurring diamonds contain Nitrogen atoms as impurities which can impart a yellow to brown color when scattered as single atoms or found in groups of odd numbers such as three atoms. Most white diamonds that occur naturally also have a tinge of yellow in them showing the presence of Nitrogen impurities. However absolutely colorless diamonds without any Nitrogen impurities are also found, but are very scarce. They constitute only about 1-2 % of all naturally occurring diamonds. D, E, and F color grades of diamonds may fall under this category. Blue diamonds that are formed due to the presence of trace amounts of Boron are also scarce and constitute about 0.1 % of all naturally occurring diamonds. Pink, red, purple and brown diamonds are formed due to plastic deformation of diamond crystals caused by the twisting and bending of the tetrahedral crystal units as the diamond rose from deep down the earth's mantle to the surface. Pink, red, and purple colors are extremely rare in occurrence, however red and purple are the rarest. Brown color is quite common. In the Argyle mines in Western Australia around 72 % of the diamonds produced are brown in color caused by plastic deformation of crystals. These diamonds are processed in India and marketed by Argyle as Cognac and Champagne diamonds. Green color in diamonds is caused by exposure of diamonds to natural irradiation over a long period of time. The diamonds had absorbed magenta wave lengths that impart the green color. Green diamonds are also extremely rare in occurrence. Besides the cut, clarity, shape and weight, two other important factors that determine the price of colored diamonds are the rarity of the color and it's intensity. Red and purple diamonds being the rarest fetch the highest prices, followed by green and blue, which are the next rarest in occurrence. The 0.95-carat fancy red round brilliant diamond, the Hancock Red set the world record price per carat for diamonds, when it was sold in 1987, at $ 926,000 per carat. In 1997 a 13.83-carat fancy vivid yellow diamond was sold at Sotheby's New York for a record price of $ 3.3 million. This works out to about $ 239,000 per carat. The previous record for an intense yellow diamond set in London in 1990 was $ 202,000 per carat.